Monica Gale Top STAMPIN'UP! UK Demonstrator: Monday AGAIN!!!! Gosh here we are again!! Starting a new week. Time is flying by is mid March already I don't know where time is going at the moment. I have been busy with so many things lately don't know which one to start telling you about. I will begin with my last post which celebrated Jo's birthday A WHOLE MONTH EARLY *insert shocked face here*. I just couldn't believe I have done that, poor Jo imagine her surprise getting a card for her birthday a whole month before. I am the biggest DODO I obviously copied her birthday wrong in my new diary at the end of last year. Oh well I guess it would have been worst if I have done it the other way round. I spent the whole Thursday in Sheffield with my fellow demos and I loved it. 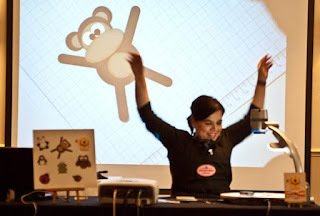 I was asked by SU to give a presentation and in true Monica style I forgot to breath and for the first few minutes I probably come across like I was going to pass out, got into it eventually and I had good positive feedback afterwards so hopefully people were concentrating on what I was actually saying rather than how nervous I was saying it. 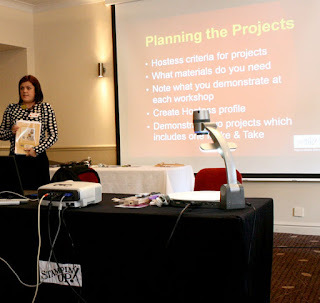 This public speaking lark is not easy you now LOL. I pinched this photo from Jo ( a lovely Passionette) just to give you a laugh and show you how terrified I looked at this point LOL. It was great I loved the whole day, we swapped as always and I took home some fabulous samples, below are a selection of the many I swapped. The wonderful Maria demonstrated a wonderful box highlighting the emboss resist technique, one of my absolute favourites. Both girls did so well. I want to thank Jo one of my lovely Passionette (I have 3 Passionettes that are called Jo in my team is your name Jo? would like to join my team? LOL) for driving all the way there and back, I really appreciated as I always drive everywhere just because I like driving, but it was nice not to have to this time, we didn't get home till 11.30 pm. Ok what else? oh I also did some crafting actually I did a lot of crafting but none that I can show right now unfortunately. 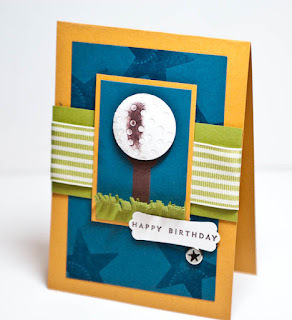 I have a male card to show which was made for the Stamp With Us challenge blog. We were meant to make a male card (yuk!!) and I did one based on my hubs hobby he is golf mad , however I won't be able to give it to him as he just recently took to reading my blog( hello honey *waves*). Not Quite Navy, More Mustard, Old Olive and my old faithful Chocolate Chip. I made the golf ball using two punched 1 3/8" circle layers, and to add texture I used the crop o dile and punched repeatedly. The sentiment shape was cut from the large Oval scallop punch. 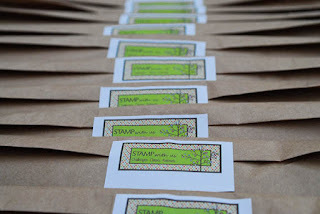 And talk about Stamp With Us there are only 6 more sleeps till our Retreat in Stratford, I have spent most of yesterday packing all the kits. and I CANNOT WAIT!! so if you're coming along you have our permission to start getting very excited. We're going to have a blast. This is a very long post and I thank you for reading it till the end. 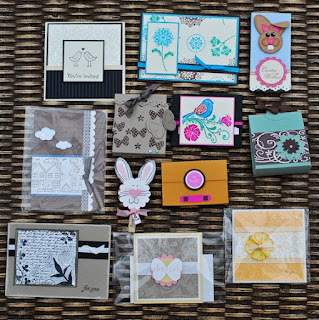 Oh Monica you just made my day as my very first event swap has made it on to your blog .... Whoo hoo!! 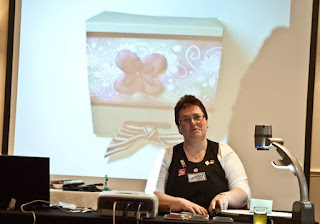 Wow looks like you had a fab time at Sheffield, wish I could have been there, fabulous swaps and some great inspiration. Oh Monica - fancy sending a card a whole month early LOL - well at least you know she will have it on the day now! Wow, all of those swaps are gorgeous! It sounds like a fab time was had by all at the Sheffield training and I can't wait for the Reading training now! Sheffield sounded and looked great ... and I love that you sent a card (and blogged it) a whole month early ... now that's organised! Tee hee. Oh it seems sooooo long ago now.. and HELLO MR MONICA!!!!! Great that he now reads your blog..
START getting excited??? i've been bouncing off the walls and ceiling for the last month, in fact probably since christmas!! Fab pix - and fab swaps but ... ahem... where are mine and Kelly's? Ok, mine was a bit gloomy, I'll admit - but Kelly's was gorgeous!